In cinema studies today, rarely do we find a direct investigation into the culture of capitalism and how it has been refracted and fabricated in global cinema production under neoliberalism. However, the current economic crisis and the subsequent Wall Street bailout in 2008 have brought about a worldwide skepticism regarding the last four decades of economic restructuring and the culture that has accompanied it. In this edited volume, an international ensemble of scholars looks at neoliberalism, both as culture and political economy, in the various cinemas of the world. In essays encompassing the cinemas of Asia, Africa, Latin America, Europe, and the United States the authors outline how the culture and subjectivities engendered by neoliberalism have been variously performed, contested, and reinforced in these cinemas. The premise of this book is that the cultural and economic logic of neoliberalism, i.e., the radical financialization and market-driven calculations, of all facets of society are symptoms best understood by Marxist theory and its analysis of the central antagonisms and contradictions of capital. 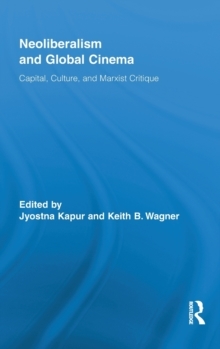 Taking a variety of approaches, ranging from political economy, ideological critique, the intersection of aesthetics and politics, social history and critical-cultural theory, this volume offers a fresh, broad-based Marxist analysis of contemporary film/media. Topics include: the global albeit antagonistic nature of neoliberal culture; the search for a new aesthetic and documentary language; the contestation between labor and capital in cultural producion; the political economy of hollywood, and questions of gender, sexuality, and the nation state in relation to neoliberalism.